I absolutely agree with your statements!! I have never seen so much hatefulness as Trump has uttered over these long months and the media has done little to call him or his surrogates out on his vile comments while giving him a pass time after time. So I say the media has had a part to play in the deplorable behaviors!! Yes, sadly the media are culpable here as well. Let us unite our voices with love, compassion, and empathy. Peace, Michael. There is a huge difference between being intolerant of someone’s behavior, and being intolerant of someone because of who they are… how they were born. This, in response to Trump supporters calling liberals hypocritically intolerant. People who put other people in a basket, should not complain when they find themselves put into a basket. Well said, David! I can only hope we can create change through modeling empathy and creating resistance around hate. Peace, Michael. Sec. Clinton’s point is quite solid and deadly serious. Nonetheless, I find myself giggling inappropriately at the turn of phrase, especially given the (lack of) character of Herr Drumpf. Are you familiar with the film “The Bad Seed”? “What will you give me for a basket of deplorables?” asks the candidate. 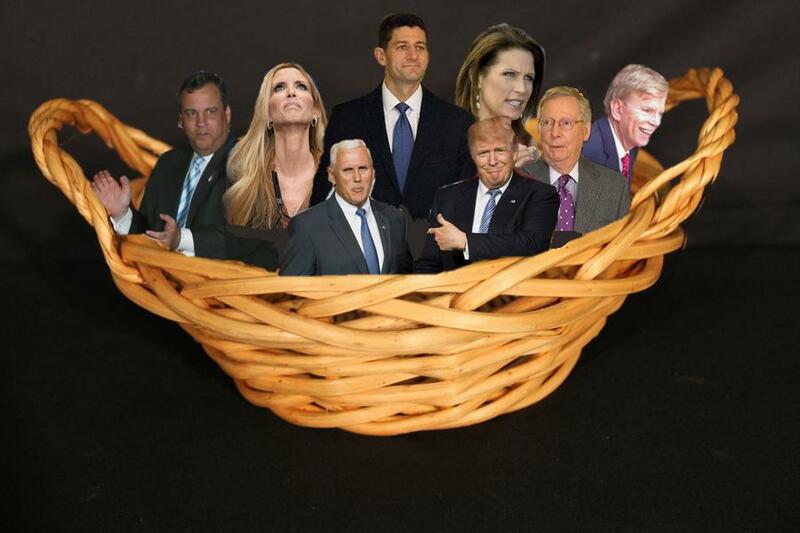 “A basket full of hate crimes,” replies the Grand Wizard. Oh goodness! Your comment made me laugh so hard! I almost made a reference to “The Bad Seed” and that Trump is Rhoda, but I was worried no one would get it! Peace, Michael. Nancy, thank you for reblogging this! Peace, Michael. While I wholeheartedly agree with the theme of your post Michael, I was quite disappointed in Hillary’s statement. Yes, there are “deplorables” supporting Trump but how does her comment improve the tone of the conversation or come close to taking the high road ? I realize that most Trump supporters (generalization coming at you…) don’t want to engage in a serious discussion of the facts but does outrage at being screwed by the system and then gullible enough to believe a bad showman equate to being deporable ? Nobody every got elected by demonizing folks like that and I frankly thought it showed a disturbing tonality similar to Trump’s outrageous statements. Jim, I appreciate your comments here, and I think I shared my own complex feelings around her statement. However, I have to say it is a seriously false equivalency comparing Trump’s hate speech and HRC’s calling out bad behavior. I think this is a place where we all have to hold some tension. Much love and peace, Michael. I wasn’t equating. Of course they weren’t equivalent statements. But if neither candidate for the highest office in the land can speak civilly and just about the issues without resorting to childish name-calling, we’ve got some serious problems. Jim, I had similar problems with Hillary’s statement at first. However, after she smartly walked back the “half” portion, I think her point is important, and more signficantly, not “childish name-calling”. Some behaviors ARE deplorable and need to be called out. Trump’s campaign has emboldened — and with the help of the press somewhat normalized — ugly currents and hateful people. Forcing the Trump campaign to declare whether or not David Duke’s actions, for example, are deplorable is a reasonable part of the political discussion. FWIW, I would also point out that your “tonality similar to” phrase definitely could be read as “equating”. I fully agree that the press has given Trump a pass on far too many horrible things that he has said and done and not called him and his more egregious supporters out. I was just sad to hear that phrase from Hillary, whether intended just to energize her base or whatever. Guess I’m just being pollyannish about what it takes to win an election these days. Jim and Penguin, I think it is messy. I’m not certain HRC is name calling, as much as I think she is calling out bad behavior. Do not miss the message behind the “deplorable” label, please!! What happened to EMPATHY? Thank you for reblogging this, Dr. Rex! Love and Peace, Michael. Most welcome. Same here, dear friend … excellent post. Oh, he’s down here again?? Didn’t know …. Arggh!! No wonder I was feeling ‘icky’!! Yes, I am sending you lots of love and good energy to help protect you! I’ll need it. He’s in Ft. Myers … quite a drive from here. Seems he’s going to exploit this weekend’s attacks!! Arrghhh .. He’s already started his tweets! Sadly, I suspect he may have some serious support in Ft. Meyers. Very well written article; meanwhile, I would not change a word of what Hillary said because I think as mean as it sounded, it was correct and very appropriate just as you pointed out. Thank you for that well written article. Thank you for your comment here. Let us hope we stand united as we try to build a more empathic nation. Peace, Michael. Dear Michael. I love this post. I had described HRCs “basket of deplorables” as politically incorrect statement, but nonetheless true. When almost 60% of DT’s supporters believe that President Obama was born in Kenya and is not an American citizen, despite overwhelming credible evidence to the contrary, then these peoples are by definition, racists. In my mind a racist person equals someone who is deplorable. Thus over 1/2 of DTs followers are in the basket of deplorables. Gronda, I always so appreciate your comments. I am hoping once the election is over (let us hope HRC is our next President) that our country will do some necessary healing and that we will look at how to address racism and all systems of oppression! Love and peace, Michael.